Christmas is finally upon us as we head into 2012 with one major UFC event left before the new year. 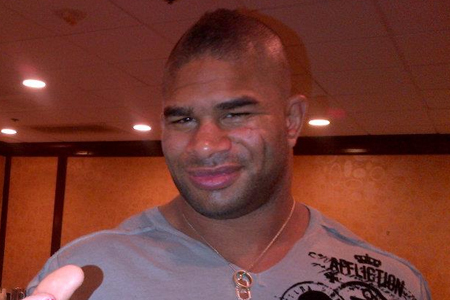 Brock Lesnar will take on Alistair Overeem this coming Friday in what will be the Dutchman’s UFC debut. Everyone loves to see the underdog win, especially because they never expect it. In MMA, unpredictability is a constant variable that truly makes it one of the most exciting sports out there. Sometimes, it’s not even the underdog, but rather the fighter that most thought had zero chance at all to win, let alone survive the fight. With a little help from the Potato Nation, we spent the last couple days gathering videos of the nastiest, ugliest, most-painful looking knockouts and submissions from this year. Finding 25 of them was the easy part. Mixed Martial Arts legend Wanderlei “The Axe Murderer” Silva gives behind the scenes look at his preparations for next year’s long-anticipated TUF: Brazil. Wanderlei Silva will coach “against” the fellow veteran Vitor Belfort. “I’ll bet anything he’ll definitely be the first to shoot in on me,” Evans said. “I just think that’s where he wants to take the fight. I think that’s where he thinks his game works best at. Despite being on this list, GSP is still a draw that the UFC will miss due to his injury. While Matt Serra may have changed GSP’s style forever, he is still a fan draw and is one of the few UFC stars that can carry a PPV card. I think we can do both. We will find girls. There’s girls around the world that will come to fight her. I think there’s some girls that can be competitive with her. According to the report, the police are hoping to the two sides can come to some kind of settlement since their versions of the story are wildly different, however it doesn’t sound like Browning or the bar owner, Simon Menzies, are at all interested in a compromise. So after simulating the 25 bouts and coming up with some kind of average outcome, THQ determined that Overeem had a slight edge, winning via first-round knockout. However, PRIDE didn’t totally die, as Zuffa began airing Best of PRIDE shows on Spike TV, and now, with the UFC headed to FOX Networks, the show will continue its run on FUEL TV. If I’m Ryu, I will defeat anyone in Street Fighter 2 — just ask Sean. You don’t need to know who Sean is. Just know that there’s a dude out there named Sean that will confirm that I will defeat anyone in Street Fighter 2. It’s nothing to be shamed about, really. I’m sure your Street Fighter 2 skills are exceptional. If the impending 2011 Inoki MMA/IGF card at Saitama Super Arena looks like a familiar friend to you, that’s because it is. The booking is reminiscent to the card produced by Inoki and promoted by PRIDE in 2000 at the Osaka Dome, where you had a mixture of MMA blending in with a pro-wrestling atmosphere.